Over more than a quarter of a century, John Paul II has firmly set his stamp on the billion-member strong Catholic Church for future generations and he has become one of the most influential political figures in the world. His key role in the downfall of communism in Europe, as well as his apologies for the Catholic Church’s treatment of Jews and to victims of the Inquisition, racism, and religious wars, won him worldwide admiration. Yet his papacy has also been marked by what many perceive as misogyny, homophobia, and ecclesiastical tyranny. Some critics suggest that his perpetuation of the Church’s traditional hierarchical paternalism contributed to pedophiliac behavior in the priesthood and encouraged superiors to sweep the crimes under the carpet. The Pontiff in Winter brings John Paul’s complex, contradictory character into sharp focus. 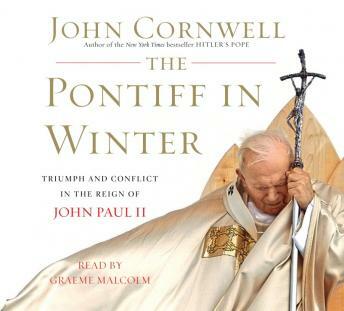 In a bold, highly original work, John Cornwell argues that John Paul’s mystical view of history and conviction that his mission has been divinely established are central to understanding his pontificate. Focusing on the period from the eve of the millennium to the present, Cornwell shows how John Paul’s increasing sense of providential rightness profoundly influenced his reactions to turbulence in the secular world and within the Church, including the 9/11 attacks, the pedophilia scandals in the United States, the clash between Islam and Christianity, the ongoing debates over the Church’s policies regarding women, homosexuals, abortion, AIDS, and other social issues, and much more. A close, trusted observer of the Vatican, Cornwell combines eyewitness reporting with information from the best sources in and outside the pope’s inner circle. Always respectful of John Paul’s prodigious spirit and unrelenting battles for human rights and religious freedom, Cornwell raises serious questions about a system that grants lifetime power to an individual vulnerable to the vicissitudes of aging and illness. The result is a moving, elegiac portrait of John Paul in the winter of his life and a thoughtful, incisive assessment of his legacy to the Church.